If you want to build DOM you can use jsdom. There's also cheerio, it has the jQuery interface and its a lot faster than jsdom. You might wanna have a look at htmlparser2, which is an streaming parser, and according to it's benchmark, it seems to be faster than others, and no DOM by default. It can also produces DOM, as it is also bundled with a handler that creates a DOM. This is the parser that is used behind cheerio. And if you want to parse HTML for crawling, you can use YQL. There is a node module for it. YQL I think would be the best solution if your HTML is from a static website, since you are relying on a service, not your own code and processing power. Though note that it won't work if the page is disallowed by the robot.txt of the website, YQL won't work with it. 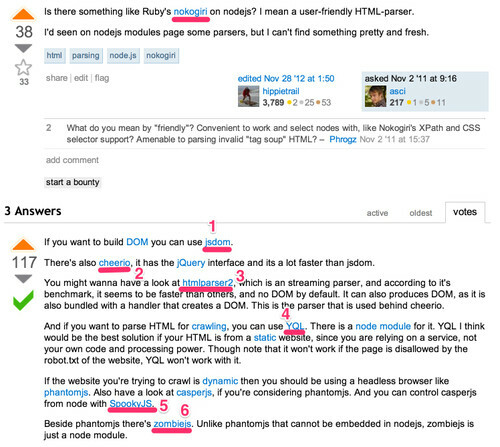 If the website you're trying to crawl is dynamic then you should be using a headless browser like phantomjs. Also have a look at casperjs, if you're considering phantomjs. And you can control casperjs from node with SpookyJS. Beside phantomjs there's zombiejs. 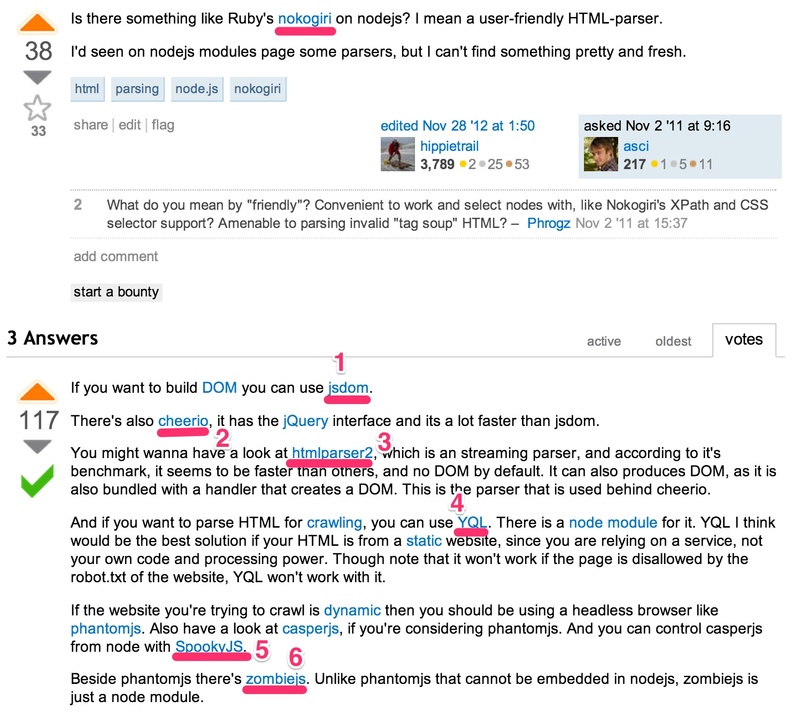 Unlike phantomjs that cannot be embedded in nodejs, zombiejs is just a node module. There's a nettuts+ toturial for the latter solutions. 久しぶりにRubyを触りました。 リンク: Rubyのプロジェクト毎のモジュール管理、バージョン管理 - Qiita. 記事を書きました。 リンク: Rubyのrssライブラリをのぞいてみる #Ruby #RSS - Qiita.